High Volume Step Down Diffusers Provides High Air Volume Delivery in a Four-way Diffusion Pattern. High Volume Step Down Diffusers are made from all steel construction with R6 rated fiberglass insulation for lasting durability. 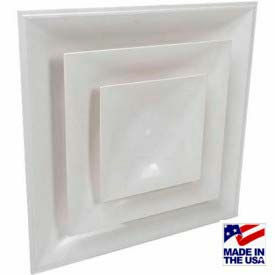 Square outlet diffusers feature a drop-down core for high volume capacity. 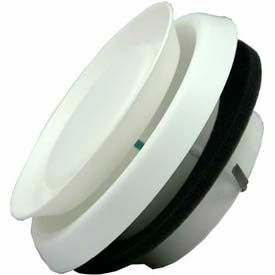 Air outlet diffuser includes a white plastic plug that covers center opening. The frame has adjustable fastening clips that adapt to different thickness and comes with hardware for easy installation easy. Aluminum electrostatically coated white for a hard finish. Available models are Lay-In Air Diffuser and Step Down Diffuser for T-Bar Lay-In. Dimensions vary per model. Speedi-Products Round Adjustable Plastic Diffuser, White, 6"
Speedi-Products 6" Round Adjustable Diffuser. Used in 6" exhaust air duct systems and fans. Can be used for Remodeling, Do it yourself & New Residential projects. Ideal for exhaust and supply air duct systems and fans. 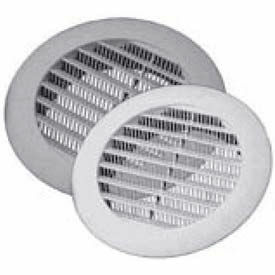 Speedi-Products Soffit Vents Are Used For Finishing Exhaust Duct Terminations And Soffit Venting. 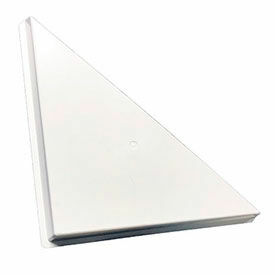 Speedi-Products Soffit Vents have UV stabilized material for long lasting durability. Silver color. Extra Long Collar Molded in mesh screen. Choose from 2", 4", 5", and 6" sizes. Use for new or existing residential construction and do-it-yourself home projects. American Louver Stratus Diffusers Allows For Easy Installation In Walls And Ceilings. American Louver Stratus Diffusers are made of ABS plastic for lasting durability. Plastic cone or plaque designs allow for easier installations, less maintenance, and improved aesthetics over metal versions. Thicknesses are 5-34", 6-1/4", and 6-1/2". Available in several sizes to meet HVAC duct requirements. Available styles are Cone, Square, and Plaque. Length and width is 23-3/4". Color finish is White or Black. Neck sizes vary per model. Package quantity is 1. 1 Year Limited Warranty. 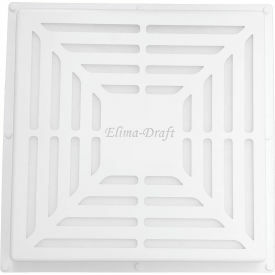 Elima-Draft Commercial Vent Covers For Diffusers Are Designed to Remove Airborne Contaminants Such as Dust, Allergens, and more. Elima-draft commercial vent covers for diffusers divert air from unused areas for improved temperature control and reduced heat loss. 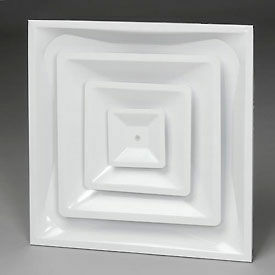 Select vent covers allow multiple directions of air flow. Plastic construction offers lasting durability. Specifications vary per model. Air Diverters Redirect Air from the Diffuser and Increases Comfort. Air Diffusers are made of polystyrene or acrylic for lasting durability. Nominal size inches are 23-3/4"L x 12"W x 2-1/2"D, 31"L x 16"W x 2-1/2"D, and 46-1/2"L x 7"W x 2"D. Quick installation: it lays in between the ceiling grid and the diffuser. Diverter will never rust and is washable. Colors are white or clear.